Halloween is a festival that takes place every year on October 31. It is a time when children and adults dress up in costumes, go trick or treating and make jack-o-lanterns from empty pumpkins . Halloween goes back to the customs and traditions of the Celts , who lived between Ireland and Northern France about 2000 years ago. They were pagans who did not believe in god. They thought that witches , demons and the spirits of dead people wandered around the world on the evening before November 1. They lit bonfires to scare them away and they tried to confuse these demons by wearing the same clothes that they did. They also offered them something to eat. In ancient Rome the festival of Pomona was held in honour of the Roman goddess of fruits and gardens. At about 800 A.D. the Roman Catholic Church introduced a new holiday which they called All Saints’ Day . It was celebrated on November 1 and the evening before became known as All Hallows’ Eve. Hallow was the old word for “ holy ”. Later on All Hallows’ Eve was shortened to Halloween. 200 years later All Souls’ Day became a church holiday. It was day on which people prayed for all their dead relatives , friends and the people that they had known. Today Halloween is celebrated mainly by children who dress up as ghosts, witches and other evil spirits . When they go trick or treating from house to house they ask for sweets (a treat) or else they threaten to play tricks on the people who don’t give them anything. Some children and adults go to Halloween parties where they have fun and play games like bobbing the apple in a tub of water. In 1950 a school class in a small American neighborhood started collecting money instead of asking for treats. They gave it to the United Nations Children’s Fund and ever since thousands of children have gone trick-or treating for this cause . In many European countries people visit the graves of their relatives on All Saints’ or All Souls’ Day . At first Halloween was not celebrated in Europe as it was in America but during the past few decades Halloween parties have become more and more popular in Europe too. The jack-o’-lantern is closely connected with Halloween. It is a pumpkin that you empty and carve a face into. Most of them have a candle or some other light in them. 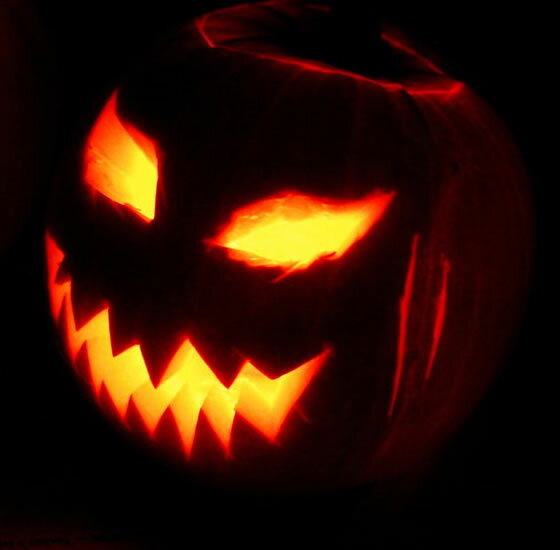 According to an old Irish story jack -o’-lanterns were named after a man called Jack. He could not go to heaven because he was an evil person and often in a bad mood . However , he couldn’t go to hell either because he had tricked the devil many times. So Jack had to stay on Earth forever and wander around with his lantern .